Personally, I think some of the best and/or most memorable movies make you think about yourself, your life, and the world and society that you live in. When it ends and you walk out of the theater, the themes, ideas, and story line linger in the back of your mind. It might make you think differently about yourself and even alter the way you perceive those around you. 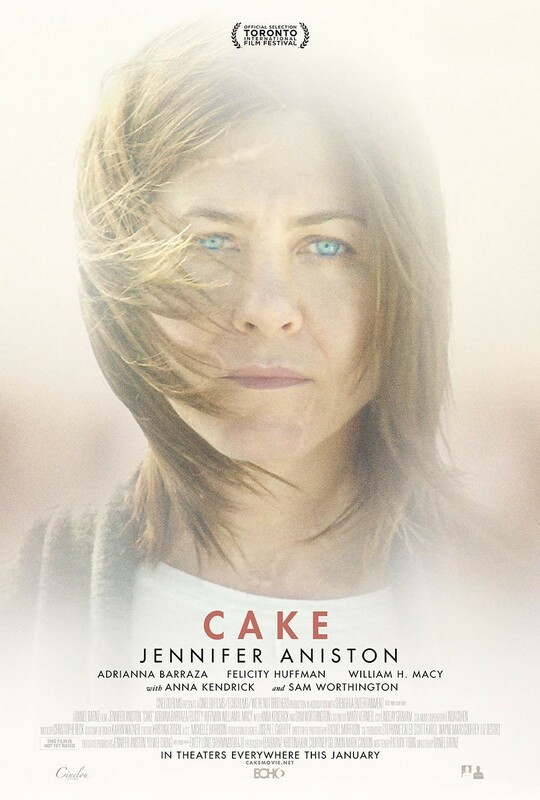 In its essence, the movie Cake, featuring Jennifer Aniston, Anna Kendrick, and Sam Worthington among others, is about a woman named Claire who was in a car accident that claimed the life of her young son and left her in chronic pain. As she struggles with an addiction to pain medication and the recent suicide of Nina, a member and friend from her support group, we watch as she makes the decision to live or die. Throughout the movie, emotions like anger, sadness, regret, and hope emerge from the characters and offer an inside look into those who are silently suffering. Despite some darker tones, Cake also provides the audience with some humorous smiles and even a few laughs. The most intriguing part is how something inside of Claire refuses to let her give up no matter how badly she wants to let go. That something makes her want to hold on even when the easiest decision would be to give up and follow in the trail of destruction that her friend left behind. The ending seems a little sudden but I think it is a huge indicator of a turning point in her life. It signifies a change and a newfound determination to move on and improve her condition even if getting there is an “uphill battle”. The movie ends on a far more positive and hopeful note than in which it started. Overall, Cake is a movie that I’m glad I saw and definitely don’t regret seeing. It may not be the best movie in theaters right now but it’s one of the best movies I’ve seen over the past few months. For me, it’s extremely relatable on a personal level as many people have entered my life suffering from a similar condition on a daily basis. Sorry for the irregular posts, weekly blog posts should resume this coming week on Thursday or Friday.